Although additive and robotic manufacturing, is considered a technology with lots of potentials in the construction industry, its deployment has not yet reached wide applications for on site construction of sustainable architectural structures. This paper focuses on the deployment of a 3D printing technology that combines robotics with natural materials for the construction of environmentally performing small scale buildings. Cable robots are explored for 3D printing with adobe, while drones are explored for real-time monitoring technologies of the construction process. A full scale prototype of the technology has been deployed during 15 days at an international construction fair, demonstrating its potential by producing live a 20 m2 pavilion. 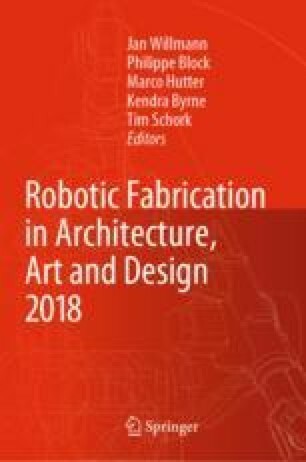 The paper describes and discusses the experience, feasibility and limitations of the technology operating on site and in a direct collaboration with human operators and craftsmen. The prototype demonstration presented in the paper has led to the conclusion that there is a significant potential of using the technology for large scale sustainable architectural constructions on-site. “OnSite Robotics” is a collaborative project between Institute for Advanced Architecture of Catalonia (IAAC) and TECNALIA. IAAC team (Concept, Coordination, Design, Extrusion, Material & Sensors): Areti Markopoulou, Aldo Sollazzo, Alexandre Dubor, Edouard Cabay, Raimund Krenmueller, Ji Won Jun, Tanuj Thomas, Kunal Chadha, Sofoklis Giannakopoulos. TECNALIA Robotic Team (Cable Robot): Mariola Rodríguez, Jean-Baptiste Izard, Pierre-Elie Herve, Valérie Auffray, David Culla, Jose Gorrotxategi. TECNALIA Construction Division team: Mikel Barrado, Idurre Fernandez, Juan José Gaitero, Elena Morales, Iñigo Calderón, Amaia Aramburu. NOUMENA Team (Drone development, Data collection): Starsky Lara, Chirag Rangholia, Daniele Ingrassia (Fab Lab Kamp Lintfort), Marco Sanalitro, Eugenio Bettucchi, Andrea Melis, Adrien Rigobello. Other partners: LIRMM (Robot research center), Luciano Carrizza (Technical adviser), Joaquim Melchor - Art Cont (Material expert), Lenze (Automation), Wam (Solid process), NanoSystem (Material nanotechnology), Nicolas Weyrich (Video animation).